For if anything can be said for our American ancestors, it was that they were on the move. Most immigrant families didn't stay in their port city of arrival. Sometimes it took a generation or two, but eventually various branches of most families migrated inland, overland, along rivers and across mountains and plains. Sometimes they spent their lives roving from one remote spot to another. Understanding these migrations is crucial. When we learn how and why people moved around, we have a lot better chance of finding family whose trails we've lost (and we're more confident it's actually them when we find them). We learn more about their lives and often identify additional kin. We may rediscover sites valuable to our heritage, like family homesteads and cemeteries. We may even discover living relatives, descendants of those who remained where an ancestor's trail led. But we have to take certain steps ourselves in order to trace theirs. What they did for a living. Just as people today follow jobs from place to place, so did our ancestors. Knowing what they did for a living may help you find where they may have come from or gone next. Career changes were common back then, but knowing someone's trade may help you identify them in the next place. Look for a relative's employment in censuses, city directories, draft registrations, Social Security applications (SS-5s), local histories, news articles, military enlistments/discharges, obituaries and family documents (like letters and pension or insurance paperwork). Who lived with and near them. People often migrated in packs: most often nuclear families, but also with in-laws, extended families and even friends. Identify every possible associate. If your ancestor and some of these folks start disappearing, a trail left by the others might lead to your ancestor. Look for names, relationships and other identifying information (like birthdates and maiden names) in all of the above-listed sources and in government and church vital records, cemetery records, land and probate records. Whether they owned land or paid taxes. Any given locale may have lured settlers with free or cheap land (especially federal lands in the Midwest and West). Look for government land grants or sales at the General Land Office Records website, in state archives and in military land records. (See "Finding & Using Military Bounty Land Records" for more information about these special sources.) Find deeds in county (or, in New England, town) government offices. Deeds often contain clues about a landowner's previous or next residence. A land sale may also signal an owner's death. Knowing how much money and property they had may help you down the road in unexpected ways. Ask for tax records at county offices, archives and historical societies, then at state-level repositories. Church records can be an important source of birth, marriage, death, burial and relationship information for our ancestors and their associates. (Even nonreligious ancestors may have had an affiliation.) Catholic parish registers may include marginal notes for later life events of those who moved away. Protestant records may include admissions and removals or dismissions, which list members' prior and next congregational affiliations. If you can identify a church an ancestor attended, it's worth looking for records via current congregational offices, church and regional archives. Whether any family members still live in town. Sometimes family stories and artifacts have lived on with any branches of the family who stayed put. When a family has lived there a long time, it's more likely someone has compiled family history information at local historical or genealogical societies. Trace descendants of ancestors forward through obituaries, censuses, vital records (when accessible) and other sources. Contact anyone in the same neighborhood who shares a family surname. Don't forget to look for maiden surnames for the wife's relatives. Our American ancestors traveled by water, roads and (eventually) rail--and sometimes all of the above. Learn what options existed in specific times and places, and you'll better be able to piece together their probable routes. Water. The easiest, safest and most economical way to travel in the British colonies and early United States was by water. The Hudson, Delaware and Potomac Rivers were among those leading inland from the east coast; the Columbia, Sacramento and San Joaquin were major west coast waterways. 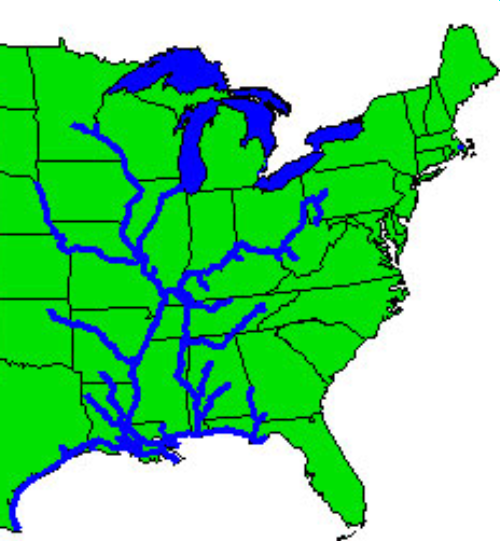 But most navigable rivers (and the enormous Great Lakes) lay in the Midwest, as shown on the map below. These river systems escorted hundreds of thousands of settlers into and through the national interior. Downstream flatboat traffic was the rule until steamboat service began in the 1810s. By the 1840s, canals offered an additional 3000+ miles of new inland routes. Navigable inland river systems. Derived from U.S. Army Corps of Engineers image. Overland routes. Road-building before power machinery was arduous and expensive work. Early settlers used Native American trails and portage paths between waterways. Eventually locals, military units and even regional governments pitched in to build better roads. Colonial highways included the Boston Post Road, the King's Highway, the Pennsylvania and Great Valley Wagon Road and more. Later roads led deeper into the interior, like the Wilderness Road over the Cumberland Gap and the National Road, which eventually extended from Cumberland, Maryland to central Illinois. Western overland trails included the California, Santa Fe, Oregon and Mormon trails. Rail lines. Trains began connecting eastern states--and displacing canal traffic--in the 1840s. By 1860, states east of the Mississippi had rail access. By 1869, transcontinental service to Sacramento was in place, and by 1885 travelers had several options for coast-to-coast train travel. Original maps will be in various archives. You may be able to borrow microfilmed ones through FamilySearch (search by Place Name and check the Maps category) or state or university libraries. Published historical atlases will be more widely available in libraries, and therefore through interlibrary loan (find holdings on WorldCat). You may find digitized maps online at sites like David Rumsey Map Collection and the Library of Congress' American Memory. (There's a special section for railroad maps.) Careful online searching may yield unique online resources like a late-1700s colonial road atlas. County and town histories sometimes mention major overland routes and local roads when describing early settlement. There's almost always information on any canals and rail service arrival because of the impact these had on communities. Most importantly, local histories may provide clues as to why your family left or came at a particular time. Find local history titles in the Library of Congress online catalog, WorldCat or in the FamilySearch catalog. Follow the same search instructions above only look under the History category after your place search. Local historical and genealogical societies and public libraries will also have local histories. Transportation histories, archives and museums. A society or individual may have preserved or published materials relating to specific canals, roads or railroads. These may also include details like what the travel experience was like; how much luggage they could take; what accommodations they would have found along the way; how common it was for women to travel unchaperoned; and what time of year was best (or worst) for travel. Look for books like Erie Canal (NY) by Martin Morganstein and the Erie Canal Museum (Arcadia Publishers) or organizations like the Pacific Northwest Railroad Archive. Online resources are rich, too. Look for overland trail maps, descriptions and histories on American Migration Fact Sheet; find a directory of historic trails or check out a cool site on canals. If you're an adventurous type, take a trip yourself on a restored canal route or historic rail line. There's nothing like experiencing the gentle, plodding pace of a canal boat or the whistles and chugs of a locomotive to make you better understand your ancestor's experiences. As you peruse other genealogical sources, keep an eye out for transportation tidbits. Letters or family histories may mention how family members traveled. City directories and newspapers may include train schedules. Regional archives may have trail diaries that describe experiences like those your ancestor would have faced on overland trails. One such database of trail writings can be found at Trails of Hope. Keeping up with the Jones' migration (or the Steinbrugers' or the O'Malleys') requires you to try to understand their experience from their point of view. Would your relative have chosen a back-breaking trek across mountains if trains were running? Was your relative even free to choose where to go, or would she have been been compelled by spouse, master or circumstances? What forces would have motivated your family to take the risks they did? No modern GPS can guide you to answers like these that keep you on your ancestors' trail. Instead, rely on some of the same forces your own family did on their journeys: good sense, good guides and a lot of (genealogical) legwork.